So let me ask you…with a New Year beginning, do you automatically start thinking about what you are going to do differently? Here at the Dawson McAllister Association we do. As we started thinking about this year we wondered what can we do this year to help empower a generation to make a difference in the world around them? And we thought about you many of you have already taken a stand and said you want to make a difference in the world. So, together, what can we do? First here’s what we commit to do. We’ve heard from many millennials making a difference in their corner of the world. They have a story and they are sharing it. We are going to celebrate their stories by posting them on my guest blog at thehopeline.com and on social media. Everything will be hash tagged with #millennials and #sharehope. We will help you share your story. 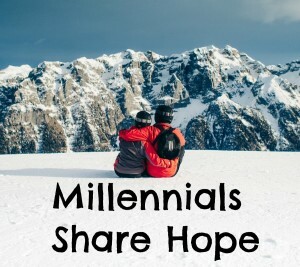 Tell your own story on Instagram, Facebook, YouTube, Twitter and hash tag it with #millennials and #sharehope. We will pick it up! Or submit a story to our stories page. Or leave a comment below in the discussion section of this blog. Second “ I realize that having a resolution to #sharehope is a bit vague. Find something you are passionate about. Homelessness, kids with cancer, bullying, texting and driving, sharing the good news of Jesus, etc. Find a way to do something about it. Can you help raise awareness about your passion? Perhaps you can blog or make videos. How can you get personnally involved? Visit kids in the hospital, serve at a shelter, lead a Bible study. Make the goal achievable. If your goal is too big, you will get discouraged and give up. For example, your goal doesn’t have to be to end poverty, rather your goal could be to make a difference in one family’s life, or help an organization that is keeping people fed. What you do doesn’t have to be big and splashy, it can start as a simple act of kindness. Never underestimate the power of kindness. And then see where it goes from there. Be accountable to someone. That someone can be us!! As you share what you are doing and post about it, we will provide you with feedback and encouragement. I’m looking forward to a life-changing year together! P.S. Write a comment below about your own inspirational story!